A code of conduct explains what sort of behaviour is acceptable at your event, how violations will be dealt with, and how to report a problem. It shows potential attendees that they should feel safe at your event. It’s important to run an event where everybody is shown respect, courtesy, and kindness, and a code of conduct (CoC) is a reminder for everybody to do that. Advertise the CoC prominently – on your website, when buying tickets, in your introductory remarks at the start of the day. Make sure people know about it. A code of conduct is only as good as its enforcement – so you have to follow through with it. Have a documented procedure for dealing with bad behaviour, and stick to it. This helps people see that you’re enforcing the CoC (and hopefully makes them feel more comfortable making a report, if they need to). It also serves as a counterpoint to people who say “this sort of behaviour doesn’t happen in our community” – unfortunately, it almost certainly does. Ashe Dryden has written a very thorough Codes of Conduct 101 and FAQ. It has lots of detail about what makes a good CoC, and answers common questions and objections. A lot of tech conferences have a Code of Conduct. You can Google around to find some examples. Conferences tickets can be expensive, and that’s before you factor in any travel or accommodation costs. You can do things to make your conference more affordable to attend. Don’t discount the generosity of your attendees: give them an easy way to contribute to the financial assistance pool. Usually financial assistance comes corporate sponsorship, but if you have generous attendees, they may contribute something as well. For example, AlterConf and You Got This both had a way to buy extra tickets. You could buy a single ticket, claim one of the free tickets, or pay for extra tickets which went into the free ticket pool. Similarly, at PyCon UK, we sell conference swag (t-shirts, hoodies, etc) through an online shop. The proceeds go directly to the financial assistance budget. Tickets aren’t the only cost of a conference: you also need to pay for travel, accommodation, food, and time away from work/home. Be ready to cover those costs as well. Have a budget for financial assistance grants, so you can contribute to some or all of those costs. This expands the pool of people who can potentially attend your conference. How you allocate those funds is a tricky question. Personally I prioritise contributors (speakers and volunteers), then first-time attendees, and I’d want it to help as many people as possible – but different events will have their own priorities. Some attendees will be able to pay out of their own pocket, and be reimbursed after the event, but not everybody’s cash flow can support that. Think about if/how you can pay advances before the event starts. Don’t just have a single ticket price. Have a sliding scale that allows people to pay different prices depending on their financial situation. 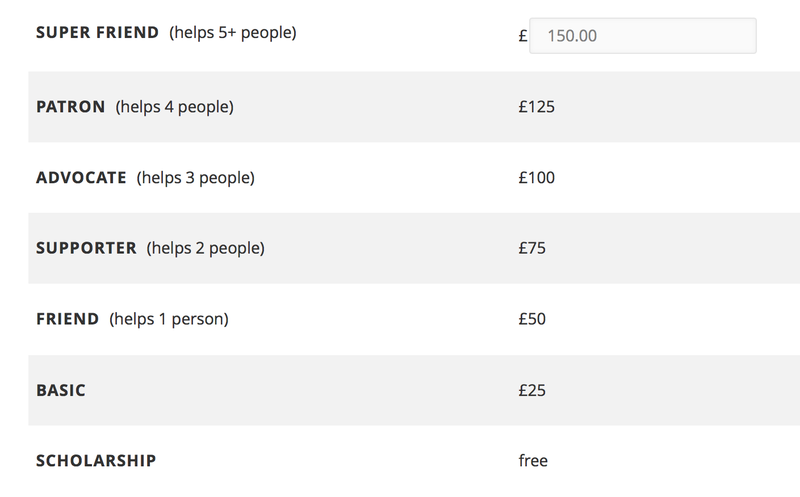 A model I’ve seen at a couple of conferences (PyCon UK, DevOpsDays London) is to offer multiple tiers of ticket prices, and let people choose what’s appropriate for them. Lots of conferences have attendees who are being sent by an employer, and companies tend to have deeper pockets – so you can charge higher prices for them. At the other end, you’ll have people who are just starting in the industry, and don’t have corporate backing – or maybe even a salary. I prefer tiers to “early bird rates” because somebody can get the affordable prices at any time. Early bird tickets disproportionately help people who already know about the conference, and know when tickets go on sale – which is likely to be people who’ve been before. At Monki Gras, there’s a Diversity & Inclusion scholarship programme which gives away free tickets to people in underrepresented groups. They get mentors and a welcome when they arrive, and then they’re treated as part of the main event. If you know the area, you probably know where’s a good place to stay – and conversely, where you really don’t want to stay. If you run a conference in the same place for several years, you’ll get an idea of where the good accommodation is – which hostels are friendly, which hotels are in a quiet area, and so on. If someone’s out of town, they won’t know any of that, so tell them. They’ll get a better night’s sleep, and enjoy your event all the more! You may be able to negotiate preferential rates at local hotels/hostels for your attendees. For the last two years at PyCon UK, we had a block booking at a local hostel (Mrs. Potts). Lots of people had a good stay there, we used it for financial assistance recipients, and we’ll probably recommend it again next year. It also helped us solve a couple of sudden problems when somebody arrived with nowhere to stay, and we were able to give them a bed in Mrs. Potts. If somebody’s travelling to a strange city for your event, help them get around when the conference finishes for the day. Help them not be stranded and lost in a strange city when the conference finishes for the day. An invitation letter can help somebody with their visa application. If you have international attendees, you may have somebody who needs a visa to come to the conference. Writing a letter to say somebody is attending or speaking at your conference is a useful service, and may help their visa application. (Sadly, it’s not guaranteed.) Be upfront that this is something you can offer, and tell people how to ask for an invitation letter. Reply to requests promptly – the wheels of bureaucracy move slowly, and delays may adversely affect somebody’s visa application. I did the visa invitation letters for PyCon UK 2018 – email me if you’d like our letter template. Provide instructions for how to get to the venue, because it’s probably less obvious than you think. For anything but the smallest events, you’ll have attendees who aren’t local. They may not be familiar with local transport or what route they should be taking. Does Google Maps take you to the wrong street? How do I get from the nearest station to the venue? If the station has multiple exits, which one should I use? You should also try to provide step-free routes to the venue, which are useful for wheelchair users or people with mobility problems. Your attendees don’t magically appear at your front door. Some transport companies provide discounts if people are going to events or conferences. For example, GWR have special conference rates, and LNER have discounts for conventions in Harrogate. See if there are any special deals that apply to you, and then tell people about them before they book their travel. Offer a dedicated room for prayer, and highlight local places of worship. Most events in the tech industry are secular, but that doesn’t mean they shouldn’t welcome delegates from different faith backgrounds. If you’re hosting a multi-day conference or expect people to be travelling from afar, pointers to local places of worship would be useful. Have a space to take a break away from the bustle of the conference. Networking and socialising is an important part of conferences, but it tires a lot of people out. Have a clearly-marked, designated space where people can sit quietly, not talk to anybody, and recover some of their energy. I wrote about the quiet room at PyCon UK in 2016, and sitting in the quiet room is how I’ve got through a number of other conferences. 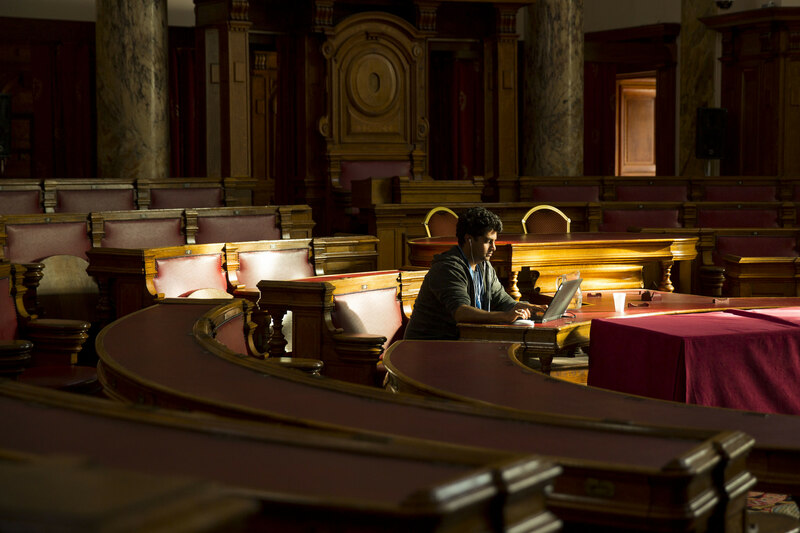 The PyCon UK quiet room is usually the Cardiff City Council Chamber, which is a lovely space for sitting quietly. It’s also a good place to work and prepare slides. Photo by Mark Hawkins. If somebody has a question, a concern, or wants to talk about the code of conduct, they need to find an organiser. Make them easy to spot. Possible approaches include brightly coloured, branded t-shirts, or different lanyards from everyone else. If you have places that are continuously staffed during conference hours (for example, the registration desk), make sure you tell people. It may not always be the most convenient, but it’s good to know that fallback exists. If you’re using branded t-shirts, make sure you get them in appropriate shapes and sizes. Don’t be the conference that only bought men’s t-shirts for a mixed group of organisers. The best venues have single-stall, gender-neutral bathrooms, and a policy that everybody can use whichever bathroom they like. At tech conferences I’ve been to, there are lots of trans and non-binary people, who are often excluded or marginalised by traditionally gendered toilets. Modifying your venue to have some gender-neutral bathrooms is a good way to make them feel included. Ideally the venue already has some. If not, you can “take over” the bathrooms with signs that make them gender-neutral for the day. Don’t worry about it, they know better than you. If your venue is large enough, the ideal is a mixture of gender-neutral and gendered bathrooms. If a venue can’t accommodate basic accessibility needs, then look elsewhere. If your venue isn’t accessible, you’ll either have people who are unable to attend, or worse, who arrive and have to head straight home. You should pick an accessible venue. If the building is on multiple levels, lifts/elevators. Sending somebody outside or to a service lift doesn’t count. Step-free public transport links nearby. Once you know what you can offer, make sure to provide as much detail as possible. Help your attendees find their way round an unfamiliar venue by providing dedicated, branded signage, with large and clear text. Good signage will save your organisers from answering the same question repeatedly, and helps attendees who can’t find a organiser, or who might feel awkward asking. We had a lot of fun making the signs for PyCon UK 2018, and I want to do it again in 2019. Finding toiletries (sanitary, dental, haircare products) in a strange city or country can be difficult. Providing them directly in your bathrooms relieves a bit of that stress. We’ll provide baskets with basic medical, sanitary and similar supplies for free at the conference bathrooms. This ensures that if somebody is caught out in the middle of the day, they don’t need to go far for help – or miss much of the conference. Examples of what you might include: sanitary products, spray-on deodorant, sunscreen, toothbrushes, dry shampoo. Put the same products in all your bathrooms, including sanitary products – periods aren’t something that exclusively affect able-bodied women. Make sure they’re in the men’s and accessible bathrooms. Providing painkillers and medication would be nice as well, but check local laws and rules first. You probably shouldn’t leave them unattended in the bathrooms (where children can get them). You might be able to give some out at the registration desk, or if not, point people to local pharmacies. You should aim to accommodate all dietary requirements, and be explicit about doing so. If you know you’ll be providing suitable food, say so upfront. Ask for dietary requirements when people buy their ticket, so you can make the right amount, or know if you’ve forgotten something. Make sure food is clearly labelled, both by category and ingredients. For allergies like nut- and gluten-free, it’s helpful to have details about the kitchen, if possible. For example, “This was prepared in a nut-free kitchen” vs “This wasn’t prepared in a nut-free kitchen, but separate utensils and surfaces were used”. For some people, that difference matters. You may need to remind non-vegetarians not to eat all the vegetarian food, so the vegetarians don’t go hungry! Separate queues for different types of food, or taking people’s food orders in advance, can both help with this. Alternatively, a couple of conferences (You Got This, Open Source Bridge) have only provided vegan/vegetarian food, so there was no risk of it running out! Lots of events assume that everybody drinks alcohol and caffeine, and just has water and fruit juice for everybody else. More variety! The tech industry has a problem with alcohol. There’s a bit of a drinking culture. Lots of events assume that everybody attending drinks alcohol, and will be comfortable drinking alcohol at the event. That excludes people (like me!) who don’t want to drink. Similarly, not everybody wants to drink caffeinated or sugary drinks, so you should find alternatives for them as well. You should have an equal number of alternatives, and make them equally visible. If you have a wide variety of alcohol drinks, and a token fruit juice, there’s scope for improvement. Ernest W. Durbin III did a Twitter survey about drinks at conferences, and their article includes suggestions for good alternatives. They’ve also got links to other articles with more discussion of food and drink at conferences. Nobody wants to be misgendered or misnamed as they’re about to speak. Don’t try to guess and misgender somebody, or mangle their name. It’s rude, and jarring for the speaker as they’re about to go on stage. Double demerit if your first language is English and you make a joke about the unpronouncability of a name. If you do mess up, correct yourself and move on. Apologise to the speaker in private after the talk, but don’t make a big show of apologising on stage – it’s distracting, and only serves to highlight the mistake. Preparing a conference talk is a lot of work. If you don’t pay your speakers, you’re restricting yourself to people who can afford to do that preparation for free. Ideally, you should be compensating speakers for their preparation time, travel, accommodation, and time away from home. You probably want to throw in a free ticket as well, so they can hang around after their session is over. Whatever your speaker package is (even if you can’t pay anything), be upfront about it in your call for proposals. If somebody can’t or won’t speak at your conference without compensation, it’s better to know that before they submit. Don’t waste time getting proposals that have to be withdrawn later. As with financial assistance, remember that not every speaker may be able to pay expenses out of their own pocket, and be reimbursed later. Think about if/how you can pay advances before the event starts. The best preparation in the world is wasted if the speaker can’t get to the stage. Presenting in an unfamilar environment can present challenges. Make sure your speakers can physically get to the stage, and present their talk when they get there. If you have a raised stage, you should provide a ramp or other step-free access from the ground to the stage. This is most visibly important for wheelchair users, but other people may have hidden disabilities that make steps hard to navigate. Being on a stage with bright lights can be intimidating. For some people it causes migraines, for others the heat is disconcerting. Be ready to reduce the lights for somebody, and provide water for them to drink onstage. At Monki Gras 2019, one of the speakers talked about getting migraines from bright lights, and the A/V team instantly dimmed them. Normally people stand to give a talk, but that’s not a guarantee. For some people, standing for long periods is a source of pain, and they’d rather sit to give the presentation. Think about how you might accommodate somebody who doesn’t want to stand. Would your A/V setup still work if they’re not standing at the lecturn? Because all your speakers use a mic, right? Ideally you should let speakers use their own laptop: it’s what they’re most comfortable with, and is the most likely to work with their presentation. If they aren’t plugging in their own laptop, test in advance that they can use your equipment. Having to use a strange computer is a potential source of problems and frustration. At Monki Gras 2019, Lorna Mitchell talked about being a keyboard-only user, and had to present from the conference laptop. She never uses a pointing device, so using a strange computer might have broken her keyboard-only presentation workflow. When something like that happens, you need to allow extra time for people to try using your equipment. Nicolas Steenhout’s story of being excluded from the Confoo speaker dinner. Accessibility isn’t just for when you’re on stage – it applies in all parts of the conference, including the evening socials. Speaking at a conference can be really intimidating, especially if you’re not used to public speaking. A mentor can help a first-time speaker prepare, and give them a valuable confidence boost. Why is it so intimidating? Because you might be nervous, or uncertain, or even attending a conference that isn’t held in your first language! Offering a speaker mentoring programme can give those people a confidence boost. If somebody is new or nervous, pair them with an experienced speaker who can help them practice and prepare. It’s a great way to get more speakers from different backgrounds, and ensure you have speakers for many years to come! It could be any kind of help, for any kind of reason: anything from someone who can advise on whether your idea for a talk is a good one to someone who’ll be happy to hear you practise it; even someone who’ll agree to be the session chair for your talk at the event. You tell us what kind of help you’d like. The Q&A session can be a stressful part of any talk, so handle it carefully. Make sure you have a chair on hand to ensure things go smoothly. If I’m chairing a session that I expect will provoke strong opinions, I remind the audience before I pass around a microphone that the Q&A is for questions, not comments. If somebody starts “This isn’t a question, but a comment”, cut them off. Move straight on to the next person. People have mixed feelings about the Q&A. Some speakers find them very helpful; others prefer to answer questions in the hallway after the session. I’ve started to see CfPs that let speakers choose if they want a Q&A, and I think that’s a good compromise. Eric Holscher has several good ideas for better ways to do questions after talks. Use a roving microphone to ensure everybody can hear the questions being asked. Not everyone can or wants to prepare a full session – but that doesn’t mean they shouldn’t have a chance to speak. 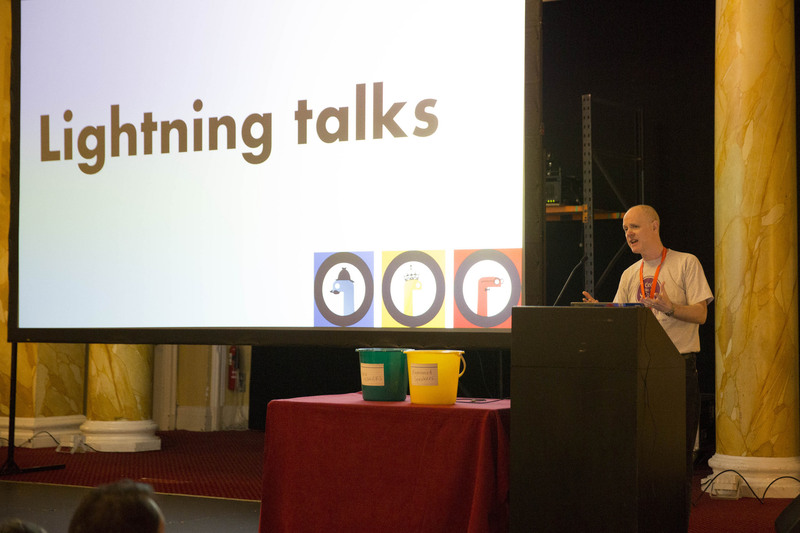 Lightning talks are short, quickfire talks – typically five minutes or less. Ususally you run a series of them back-to-back. They’re fun to watch because you get a variety of topics in not very much time, and five minutes is long enough to say something interesting, without needing lots of preparation. And at least at conferences I’ve been to, the audience is very supportive and friendly. It’s a great venue for somebody to try speaking for the first time. It’s important to make these talks a dedicated part of the schedule – for example, at PyCon US, there was a slot for lightning talks at the beginning and end of the day. I’ve seen a few events run them in the lunch break, when most people would rather have food and talk to other attendees. Making it a timetabled event gets better attendance. At PyCon UK, the signup for lightning talks is extremely popular. We want to make sure new speakers get a chance to speak, and not just all the old faces, so we use a lottery system, with dedicated slots for new speakers. Owen Campbell explaining lightning talks at PyCon UK 2017. Owen ran the lightning talks last year, and helped come up with the lottery system. You can see the two buckets for submitting talks in the picture. Photo by Mark Hawkins. Destigmatise the feeding of young children in public spaces, and provide a space to do it privately if people prefer. It’s 2019. Feeding young children (whether breastfeeding or formula feeding) should be destigmatised, and acceptable in all conference spaces – including in talks and at mealtimes. A free crèche means that attendees don’t have to worry about arranging childcare (or leaving a child for their partner to look after). Quite a few conferences solve this problem with a free crèche. 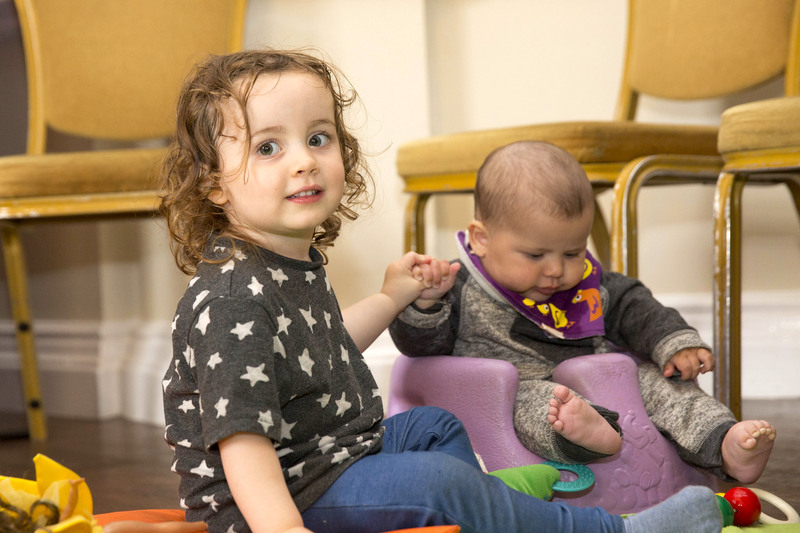 If you have a young child, you sign up in advance, and the conference hires registered and qualified childminders to look after children during conference hours. The adults can focus on the conference, and they know their kids are being looked after safely. Parents will want to know who’s looking after their children. Be ready to provide details of your childcare provider. A consistent challenge is getting people to use the crèche. You book it, you run it, and people turn up and say, “I wish I’d known about this!”, and it goes underused. I don’t have good answers for that one yet. A Conference Crèche How To, by Tom Bennett provides more detail on actually running a crèche. The conference in question was in education, not tech, but the same principles apply. Two of the youngest attendees at PyCon UK 2017 – taking advantage of the free crèche. Photo by Mark Hawkins. If you have microphones, connect them to the hearing loop and make sure that everybody uses them. A lot of venues will have audio induction loops for the benefit of the hard-of-hearing (it’s required by law in the UK). Provide microphones for anybody who’s speaking, and connect them to the hearing loop. Remind your speakers to use the microphone, even if they think they can project their voice – it makes it much easier for people who are hard-of-hearing. If you have a Q&A, repeat questions into the microphone, or even better, have a roving microphone. If you’re recording the sessions, using a microphone means you get much better audio quality. Remind people not to tap or blow into the microphone – the sudden noise can be painful to anybody using a hearing aid, as the sound goes straight to their ears. Asking “can everybody hear me” into a microphone is pointless, because anybody who can’t hear you won’t hear the question! If you have to ask, it’s better to put the question on a slide in big text. Don’t play with other people’s stuff without asking first, and remind other people to do the same. Some people will be more than happy to explain how their tools work, and they often contain some very sophisticated technology. (I was blown away by a demonstration of a finger-sized OCR device recently.) But it’s up to them to decide if they want to talk about it, and what to show you – ask, don’t assume. If your attendees aren’t familiar with these rules, a reminder might be helpful. Smoking and strong fragrances can be an issue for people with allergies, so ask attendees to check their smells at the door. Cigarette smoke is a problem for people with a range of allergies, as well as being generally unpleasant. Try to keep cigarette smoke out of the main conference areas. There’s been a UK smoking ban for over a decade, and I’m used to people having to go outside to smoke, and there are similar bans in other countries. If it’s not enforced by local law, consider making the conference areas “smoke-free” for the duration of the conference. Similarly, strong fragrances and scents can cause allergic reactions or trigger migraines. You should ask people to attend without fragrances, to avoid anybody being taken ill.
How to be fragrance free, by Think Again consulting, gives a bit more detail on why fragrances might be a problem, and how somebody can travel fragrance-free. There are simple rules that make slides easier for everyone to read. If speakers have informative graphics in their slides, they should describe them aloud for visually impaired members of their audience. If speakers want to include graphic images of harm or something similarly distressing, consider asking them whether they really need it, and if they do, to provide a content warning. Posting slides online, or having printed copies, can be useful for people who struggle to read from a projector or screen. The speaker guidelines for Nine Worlds have some good suggestions, particular around content notes and AV. It can be hard to get around quickly – longer breaks in your schedule means everyone is more comfortable. If you’re running long sessions, people will want to move around in the breaks. They might be going to the bathroom, or to get a drink, or going to a different room if it’s a multi-track conference. Particularly in a large venue, it can be difficult for people to get around quickly. Maybe you have a wheelchair, or a child, or a foot injury, or you’re talking to somebody about the session that just finished. Make sure you plan sufficient breaks between each session. People won’t be rushing around the building to get to talks, and your speakers will be less distracted by late arrivals. A sign language interpreter can help an attendee who’s hard-of-hearing, both to understand talks and when chatting in the corridor. This is similar to real-time captioning – it makes the event more accessible to people who are hard-of-hearing. Note that these are distinct things: some people can understand sign language but have more difficulty reading; for others the opposite is true. It’s less useful to a general audience, because most people aren’t fluent in sign language. But if the interpreter stays with a particular person, that allows them to participate in conversations outside the main sessions. Remember that sign languages vary around the world – for example, British and German Sign Language are as different as English and German. And even the English sign languages differ – British Sign Language and American Sign Language are two separate languages, and mutually incomprehensible. It’s not like British and American English. If you’re running an event in multiple languages, you may want an interpreter for each language. As with live captioning, it’s helpful to provide the interpreters with a list of specialist/technical terms in advance. Most events I’ve seen only offer sign language interpreters upon request, but provide live captioning as standard. Hiring a stenographer means you can provide real-time captioning of talks, which makes them easier to follow for people who are deaf and hard-of-hearing. The real-time captions can be displayed on screens alongside the speaker, showing what they’re saying. Primarily this helps people who are deaf, hard-of-hearing, or non-native speakers. It can also help if somebody misses a word, the speaker has a strong accent, or their focus drifts – the transcript gives them a way to catch up. To support the captioners, ask speakers for specialist/technical terms in advance. They can be programmed into the stenographer’s special keyboards, so you get more accurate captions. Make sure the screen(s) showing the captions are easily visible – ideally raised enough that they’re visible from more than just the front row, and on both sides of the stage if you have room. Captioning can happen in-person (when the captioner travels to the event), or it’s possible to do it remotely over Skype. I first saw this at PyCon UK 2016, but I’ve since seen it at lots of other conferences. Ashley Nelson-Hornstein has a blog post describing the value of live captioning at UIKonf. Lindsey Kuper, one of the ! !Con organisers, explained the value of having live captions at the conference. 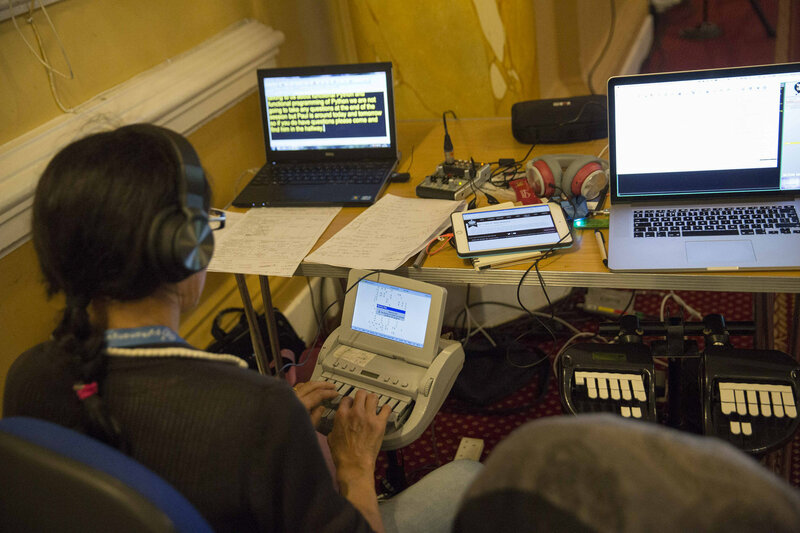 One of the stenographers at PyCon UK 2017. They use a special keyboard to keep up with the speakers, and can hit over 250 wpm. Photo by Mark Hawkins. If the venue permits, allow service animals throughout, and make sure the animals are looked after. Ideally you want to allow service animals throughout the conference. Remember basic etiquette: service animals are working, so don’t pet or distract them without checking with the owner. You might stop them from doing something important! Have reserved seating for people who need a clear view of the screen, or are in a wheelchair and can’t move into the row. These are both ideas I saw at AlterConf London, and have yet to see anywhere else. If you have vision problems, it’s easier to sit nearer the front so you can have a clear view of the slides. If you’re hard-of-hearing, you want to sit close to the front, with a good view of the live captioning screens (if there are any). At AlterConf, there were aisle spaces marked out in blue tape for wheelchair users, so they could sit in the audience with their friends. Often wheelchair spaces are near the back, away from everybody else – having them inline is better. If you don’t want to mark out explicit spaces, think about whether you can move or rearrange chairs for a wheelchair user to sit in the aisle or at the front. Simply saying a venue is “wheelchair accessible” is rarely enough, because wheelchairs come in different shapes and sizes. More detail is better. Is there step-free access within the venue? Is it ramps or lifts? How big are the lifts? How wide are the doorways? If the main area is some way inside a building, what’s the narrowest doorway you need to get there? Are there wheelchair spaces inside the auditorium? How wide are the aisles between the seats? How easy is it for a wheelchair user to get to the venue? It’s no good having an accessible venue that’s surrounded by raised kerbs and without any step-free public transport. Are there heavy doors inside the building that a wheelchair user might struggle to open? Is there a route with automatic doors? What’s the floor surface like? Heavy carpet, tiles, wood – if you’re walking they’re mostly the same, but they can be very different in a wheelchair. This might make the difference between whether somebody can physically attend your event, or they can’t. If it’s the latter, it’s much better to find out before they turn up. If your website isn’t accessible or is missing critical info, there are people who can’t even get through the front door. There are lots of good resources about web accessibility, so I won’t repeat the details here. The W3C accessibility guidelines (WCAG) are a good starting point; search around for other advice. Is the font size sufficiently big? Does the layout break if I increase it? Is there enough colour contrast? Can you navigate the site without a pointing device? Can I easily see/find links? Useful information? Do you have alt text for any informative images? This needs to apply to all aspects of the conference site: the initial information, schedule, ticket buying, call for proposals. At Monki Gras 2019, Lorna Mitchell’s talk flagged Typeform as completely inaccessible to keyboard-only users. Her example was a Call for Proposals that was done in Typeform – and since she can’t use the form, she won’t submit to that conference. Phrases like “ladies and gentlemen” and “boys and girls” are alienating to trans and non-binary attendees. Gendered language can also come up when you’re identifying an audience member (for example, somebody who’s asking a question). I find clothing a good way to identify people – so rather than saying “the woman in the second row”, I might say “the person in the green scarf”. Appearance isn’t a good way to determine gender. And as a bonus, clothing is almost always more specific than a gender, or a vague gesture and “you there”. Conference swag and speaker gifts are a nice gesture, and well-intentioned. But be wary of common gifts that can be inadvertently insensitive. A bottle of wine? Not everybody drinks alcohol. Chocolates? Make sure you’ve checked for dairy and nut allergies, and your speaker doesn’t have an eating disorder. Neckties? Yes, this actually happens. T-shirts that are only available in a men’s cut or men’s sizes. Socks. We had Python-coloured socks for PyCon UK 2017, because socks are an item of clothing that most people are likely to wear. Water bottles. I think this was another PyCon, but I’m not sure. It’s another accessory that most people use, and may be grateful of before going on stage! I’m sure you can think of other ideas that have universal appeal. And whenever a conference does this, I see a flurry of goodwill and nice tweets about it. If you’re running a conference in multiple languages or in a place where fluency level varies, consider offering more than just English. A lot of conferences in the tech industry are conducted solely in English, even if they’re hosted in a country where English isn’t the first (or second or third) language. This can lock out people whose English isn’t good enough to follow a day of conference talks. Run talks in multiple languages. I’ve heard of conferences in Germany that have an English track and a German track, and I’m sure it must happen in other countries. Provide live translation of talks. You can hire translators who provide a real-time translation of the talks, which people can listen to in headphones. This almost certainly requires more infrastructure, but it’s nice to think about. If you’re doing this, you might want to consider captioning in multiple languages as well. Letting people put pronouns on their badges reduces the risk of being misgendered, and makes the event more comfortable for trans/non-binary attendees. Let people choose which pronoun badge/sticker they want, if any. Don’t hand them the one that seems to match their appearance, which is a mistake that happened in at least one conference. Names are complicated, and you can’t be sure what name somebody wants to put on their badge – so ask! People put all sorts of names on their badges – wallet names, nicknames, their online handle – whatever they think will help people recognise them. Don’t make assumptions about what should be printed there, or what they’ll prefer. Don’t just use the name from somebody’s legal ID – this causes problems for trans and non-binary people, or anybody using a different name professionally to their legal name. For example, married women who work under their maiden name. The name field should be a single, free text field – no “first name, last name”, or other assumptions about the structure of names. Give people a way to signal how comfortable they are socialising and talking to new people. Each attendee receives three cards included with their name badge and holder. […] The colored cards can be slipped behind the name badge in the holder so they’re visible to other attendees. A green card with a triangle means that the wearer wants people to come up and talk to them. Yellow, with a circle, means they want only people they know to approach them, and red, with a square, means that they want to be left alone. In each case, the person wearing the badge may still approach people they want to talk to, but if someone is wearing a yellow or red badge, they generally want to keep being approached to a minimum. Note the use of shapes, so this works for colourblind attendees as well. The system was developed by the Autistic Self Advocacy Network. I haven’t seen it at a conference myself yet, but I think it’s a nice idea. I met somebody recently who always ties a knot or two in their conference lanyard before wearing it. They’re quite short, and the default lanyard length leaves the badge hanging near their crotch, which is just awkward and unpleasant. Adding the knots shortens the lanyard, and pulls it up a bit. I don’t know if there’s a good, general-purpose solution for this (multiple lengths of lanyard? ), but I’m writing it down because it’s another thing you might want to think about. We use name badges to identify people. So make them easy to read! In practice, that means printing the name in a large, clear font. Every conference I’ve been to has done plain black on white in a sans serif font, and that works well. Nobody wants to waste time reading the badge – keep it short, simple, easy to glance at. If you’re using badges with a lanyard (and not a badge holder), print on both sides of the badge, so it remains readable if it flips over. Not everybody likes having their photograph taken, and coloured lanyards make it easy for people to opt out. At any conference, there will be some people who don’t want to appear in photographs. That’s fine, and you should give them a way to opt out. Approaches like “talk to an organiser” or “put a sticker on your badge” don’t really work – they scale badly, and if you take a picture of a crowd, it’s hard to see if anybody has the badge sticker. PyCon UK 2017 had blue lanyards if you were happy to appear in photos, yellow lanyards if not. DjangoCon Europe 2018 was the same scheme, but black/white instead of blue/yellow. XOXO 2018 had three colours: blue if you were okay appearing in photos or videos, yellow if it was okay but ask permission first, red if you didn’t want to appear in anything. The key is having a bright colour that means “no photos please”. It stands out in a crowd, and makes it clear if you’ve accidentally snapped somebody who didn’t want their picture taken. It should stand out at a distance, and to somebody who’s colour blind. Flash photography is a particular issue for some people (e.g. with epilepsy). It’s also distracting if you’re on stage and a flash goes off at the back of the room! You may want extra opt-outs for that; I know a few people who learnt that the hard way. If you have children at your event (e.g. a young coder’s workshop), give all of them the “don’t photograph me” lanyard to avoid red tape around photographing children. 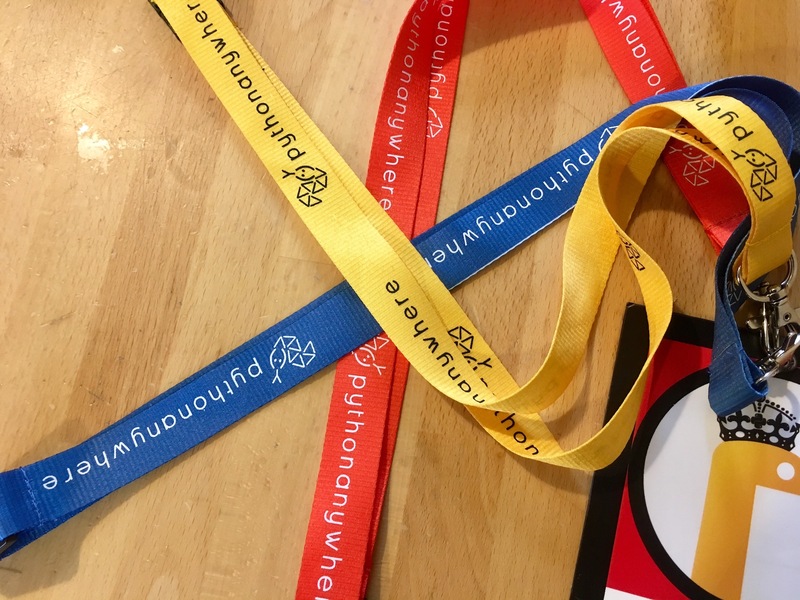 The three colours of lanyard at PyCon UK 2017. Yellow if you didn’t want to appear in photographs, blue if you were happy to appear in photographs, red if you were an organiser or volunteer. Photo by me. One of the great parts of regular conferences is having a chance to see people you don’t see anywhere else – for example, I have friends I only see when I’m at PyCon UK. But there’s a risk a conference can get a clique-y feel – everybody who’s been before knows each other, and you feel left out if you’re new and don’t know anybody yet. If you want your conference to grow, it’s important to make newcomers feel as welcome as the old timers. If you’re a person who’s attends the same conference regularly, take some time to break out of your bubble and meet newcomers. If this is your Nth PyCon, then you have to meet N new people every day. My strategy was at breakfast and lunch, when wandering around looking for a table to sit at, choose one with no one I know, and with people that don’t look like me. When standing as a group of people, always leave room for 1 person to join your group. At PyCon UK last year, there was a #social channel in the conference Slack. If a group of people were going out for the evening, and had room for a few more, they’d post it in this channel – and people would take up that invitation. If they run for a long time, conferences develop fun traditions and in-jokes. That’s okay, but consider publishing a glossary of these terms, so somebody who’s new doesn’t feel confused or left out. Here’s an example from DjangoCon Europe 2016. Coming to a conference for the first time can be intimidating, so make sure you’re giving a warm and useful welcome to your first timers. For several years, Write The Docs conferences have run a “Welcome Wagon” – there’s a dedicated session for meeting other first-time attendees, tours of the venue, and a bunch of information about how the conference works. The Welcome Wagon for the 2018 Prague conference has lots of advice and suggestions about how to get the most from the conference. Although a lot of that page is Prague or Write The Docs-specific, the questions apply to any conference – you could write answers for your event.